The construction of the Skipton-Colne ‘branch’ was an initiative born on the east side of the Pennines as an extension of the Leeds & Bradford Railway (L&B), although it would become part of a trans-Pennine route when it joined the East Lancashire Railway at Colne. The origins of the Skipton-Colne line can be traced back to the North Midland Railway that opened from Derby to Masborough (Rotherham) on 11 May 1840 then on to Leeds (Hunslet Lane) on 1 July 1840. This company merged with the Midland Counties and Birmingham & Derby Junction railways to form the Midland Railway (MR) on 10 May 1844. The MR became one of the most important railway companies in Great Britain with a network that extended from London, Dorset and South Wales to the Scottish border. The Leeds & Bradford Railway followed the valley of the River Aire and the Leeds & Liverpool Canal westwards from Leeds to Shipley, where it turned southwards to Bradford. The company was incorporated by Act of Parliament on 4 July 1844, and the line was built in almost exactly two years and opened officially on 30 June 1846. In Leeds the line was connected to the MR’s Hunslet Lane terminus in Leeds by means of a short spur and a connecting loop at Holbeck Water Lane and Canal Junction. The Act of 1844 was granted on the understanding that an extension would be built from the Bradford terminus, through Halifax to join the Manchester & Leeds Railway (M&L) in the Calder Valley. Avoiding a digression here into 1840s railway politics, in November 1845 all seemed set for such an extension to go ahead and also for the L&B and M&L to amalgamate. However, history was to take a different course. In 1844 the Lancashire & Yorkshire Junction Railway (L&YJR) issued a prospectus for a line connecting the intended Blackburn & Preston Railway with the L&B at Shipley, and it would approach via Colne and Airedale. As noted above, the L&B had its own plans to extend westwards to the Calder Valley, and when representatives of the L&YRJ and L&B met to see if some agreement could be made there was no progress. In July 1844 the L&B was approached by townspeople of Skipton and by the Blackburn & Preston Railway to consider extending its route north-westwards from Shipley, through Skipton to Colne. At first the suggestion was brushed aside, but in September the L&B relented, recognising that this line would thwart the L&YJR plans to build its own route to Shipley and an end-on junction with the latter company’s intended line at Colne would be a useful link to a rapidly developing industrial region. Returning to November 1845 when amalgamation of the L&B and M&L looked likely, this arrangement alarmed the East Lancashire Railway (ELR), successor to the L&YJR, who stood to gain much interchange traffic at Colne if this traffic travelled via the M&L Calder Valley route instead. The ELR response was to propose an East Lancashire & Airedale Railway from Colne to Steeton which would join another proposed railway (the Wharfedale Railway) to provide a route through to the Leeds & Thirsk and thus to north-east England. There is a stretch of sparsely populated high moorland, locally known as the Moss, between Colne and Steeton which would present problems, and it was proposed that ‘atmospheric’ traction could be used – as on the South Devon, London & Croydon and Dublin & Kingstown lines, all of which quickly abandoned it as impractical. As events turned out the line from Colne to Steeton was not built thanks to a row that erupted between the L&B and M&L, the directors of the former accusing the directors of the latter of deviating from their agreements to the disadvantage of L&B shareholders. The L&B -one of the companies in which the railway entrepreneur, the ‘Railway King’ George Hudson had an interest - was then offered on lease to Hudson’s MR with the promise of benefits to shareholders, and this came into effect on 26 August 1846 with the L&B becoming fully vested in the MR on 24 July 1851. Thus it was that the Midland Railway reached Colne. The line from Shipley to Keighley opened to public services on 16 March 1847 and the section onward to Skipton opened about six months later on 8 September. The original Skipton station was replaced with one 10 chains (220yd) north on 30 April 1876. The contract for the line from Skipton to Colne (the ‘Thornton contract’) was awarded to Messrs G Boulton & Co on 9 September 1846 at a cost of £67,000. An agreement was reached in August 1848 between the East Lancashire and Leeds & Bradford that each company would work its own line to Colne and that there would be a joint station at Colne which the L&B would construct along with a 2-road engine shed. The Skipton-Colne line opened on 2 October 1848 followed by the ELR’s continuation to Burnley on 1 February 1849. Under the terms of an Act of 24 July 1851 the Leeds & Bradford Railway, including the Shipley-Colne extension, became part of the Midland Railway company. The East Lancashire Railway was absorbed by the Lancashire & Yorkshire Railway on 13 August 1859. From 1856 LYR trains were permitted to run over the Skipton-Colne route; the working timetable for 1 July 1884 shows two down LYR passenger trains using the route. The cotton-working town of Barnoldswick was missed by the Skipton-Colne line which passed instead through Earby, about 1½ miles to the east. A branch from Earby to Barnoldswick was authorised by an Act of 12 August 1865 and it opened on 8 February 1871. The junction was, appropriately, north-facing providing for direct travel between Barnoldswick and its West Riding neighbours of Earby and Skipton rather than with Colne in Lancashire. 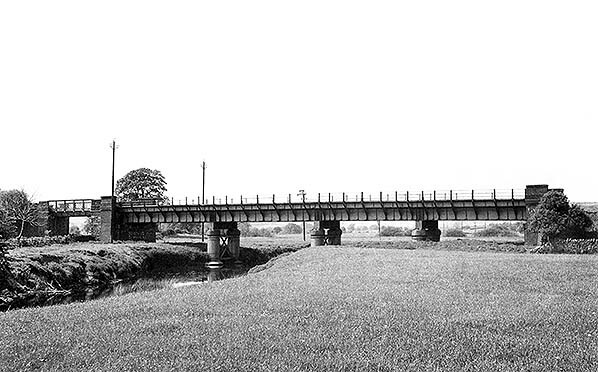 The bridge over the River Aire near Skipton on the Colne Branch looking towards Broughton Road in the mid 1960s. It has been demolished. In 1873 there was a proposal to install a north-west curve at Skipton North Junction where the Colne branch diverged from the Skipton to Lancaster line to form a triangular junction, but nothing came of it. Other more ambitious projects would have affected the status and traffic of the Skipton-Colne line. One such was the Blackburn, Clitheroe & North West Junction Railway for which an Act was obtained on 27 July 1846 for a route from Blackburn (Daisyfield Junction) to Clitheroe, Chatburn and Long Preston (to a junction on the ‘little’ North Western Skipton-Ingleton/Lancaster line) with a second route to Elslack on the Skipton-Colne route. All that came of this scheme was the Blackburn-Clitheroe-Chatburn line which, after a long interval, was extended to Hellifield. In the mid 1860s another abortive project was the Fleetwood, Preston & West Riding Junction Railway which would have left the Longridge Branch at Grimsargh and proceeded via Clitheroe to join the Skipton-Colne route at Elslack. An Act of Parliament was obtained on 14 August 1890 for a line that would have provided an east-west link at Colne. This was the North West Central Railway from Penwortham (south-west of Preston) to Whalley, Colne and Keighley, and it is shown as projected on Airey’s map of 1893. The independent, financially struggling West Lancashire Railway (Preston-Southport) instigated this scheme which Biddle (Railways of Preston 1989) describes as ‘a madcap project aimed at making a new route between north-west and north-east England … a line that would require very heavy engineering across hilly country to connect Bradford, Halifax and Keighley direct with Preston and Liverpool, using the West Lancashire between Penwortham and Southport’. The project was abandoned by an Act of 1893. The West Lancashire Railway was absorbed by the LYR in 1897. Excursion trains frequently used the Skipton-Colne line. Binns (2008) includes timetables and operating instructions for a number of excursions in the early 1880s with such destinations as York races, a pantomime in Bradford, Scarborough and Hawes (Wensleydale). The Skipton-Colne line did not achieve the importance of some of the other ‘trans-Pennine’ routes such as the Calder Valley and Standedge lines between Leeds and Manchester or the Woodhead between Sheffield and Manchester, despite its strategic position between what were the large and prosperous of the large Lancashire towns (Preston, Blackburn, Accrington, Burnley, Bury) and the major West Riding centres of Leeds, Bradford and Keighley and its apparent advantages of easy gradients and no lengthy tunnels or major viaducts to maintain. The line’s failure to become a major through route for passengers was in no small measure the outcome of divided administration at Colne. From the earliest days passengers usually had to change trains at Colne between the East Lancashire (later Lancashire & Yorkshire and from 1922 London & North Western: LNWR) and Leeds & Bradford (later Midland) services, and connections were not always conveniently timed. The ‘Big Four’ Grouping of 1923 when the Midland and LNWR became part of the new London, Midland & Scottish Railway (LMS) could have been the opportunity to end the practice of treating the lines to Colne as two branches; however, Colne now found itself as the frontier station between the Central and Midland divisions of the LMS, and the two divisions were reluctant to co-operate with each other. As a result, passengers still had to change trains at Colne. Binns remarks that often the Midland Division train would leave just before the ‘Lanky’ one arrived, leaving the passengers to dash from the station up the hill to where Ribble buses departed for Skipton. A similar historic frontier was maintained post-Grouping at Kelso (Roxburghshire, Scotland) where trains on the former North British route from St Boswells and on the old North Eastern route from Tweedmouth continued to terminate although it was a through station. On 1 January 1948 the LMS network in England and Wales became the London Midland Region (LM) of the new British Railways (BR). Under the new regime the invisible boundary at Colne soon crumbled and the summer 1950 timetable showed several services each day passing through Colne, although some trains from each direction still started or finished their journey at this point. BR made little improvement to the stations and, indeed, closed Elslack in 1952 and Foulridge in 1959. Earby station was modestly modernised with BR(LM) running-in nameboards replacing the LMS ones, but only one BR totem nameplate seems to have been installed, and this was a wooden example, perhaps informally manufactured by a BR employee who wondered why Barnoldswick had been provided with them whilst Earby had not. Earby remained gas-lit while Thornton-in-Craven retained its LMS nameboards and oil lighting. Steam haulage of local Skipton-Colne trains gave way to diesel multiple units (DMUs) from 4 January 1960 and from 6 March 1961 DMUs took over the Skipton-Colne-Manchester passenger services, with the exception of a Skipton-Liverpool train and its return working. Looking north from the footbridge at Earby station in March 1965. A Class 113 Cravens DMU bound for Manchester Victoria is standing at the down platform. The station was gas-lit until closure; one of the standard-mounted Sugg specimens is in the foreground – a style favoured by BR London Midland Region. In the distance the goods shed is visible. Whilst The Reshaping of British Railways (‘Beeching Report’) of 1963 recommended the abandonment of the former LYR lines from Accrington and Bacup to Bury and Manchester as well as the Copy Pit route (Rose Grove-Todmorden/Hebden Bridge) the only closures proposed in the locality of Colne were the Barnoldswick Branch from Earby and Thornton-in-Craven station. Commenting on the report the editorial in Nelson Leader (29 March) was relieved that the local towns would not be ‘cut off entirely from the grand new age of “railway autobahns” – not just yet, anyway, … Nelson, Colne, Brierfield and Earby stations, anachronistic and dilapidated though they may be, remain in restricted use. But the indications are that they will become little more than minor halts of ever-decreasing importance on the local line. This proved to be the case for the first three stations which, within a few years, became unstaffed (but Earby was to close). The editorial concluded with the opinion that nationally Dr Beeching’s proposals were ‘economically progressive’ with the anomaly that in the purely local sense, ‘here and elsewhere they can only be regarded as retrogressive’. 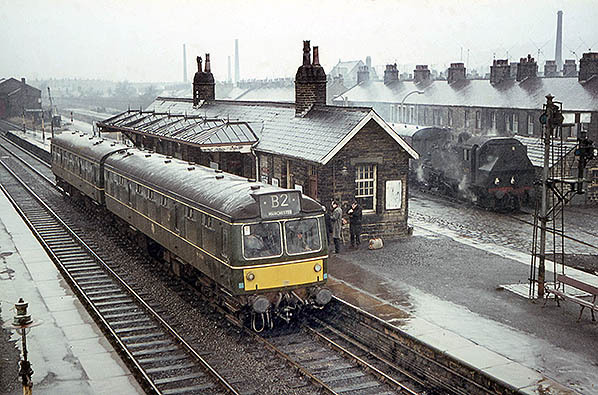 Although the Barnoldswick Branch was formally proposed for closure on 4 September 1964 and the service was withdrawn on 27 September 1965 it seems that Thornton-in-Craven slipped beneath the radar. In March 1967 the Ministry of Transport and British Railways Board jointly published the 'British Railways Network for Development' map: not the finest example of cartography! The thick black lines show passenger and freight or passenger only lines; thin black lines are for freight only; thick grey lines 'on present evidence are not proposed for inclusion in the basic network'. This map shows that only the Burnley-Colne (not named)-Skipton (not named) route will provide passenger access to Skipton with the routes to Leeds, Bradford Forster Square, Horton-in-Ribblesdale (on the Settle & Carlisle) and Grassington retained for freight use only. Within two years, far from being intended as the only railway passenger route to Skipton, the Colne Branch was to be proposed for complete closure. The future of the line through Colne looked secure when, remarkably, it was identified in 1967 (along with the Copy Pit route – which had actually been closed to passengers since 1965!) as part of the ‘Network for Development’ and the only route to be retained to Skipton; the lines from Skipton to Leeds, Carlisle and Lancaster would close. However, in a complete volte-face the following year the decision was made to retain these three lines from Skipton and instead to close the route from Colne. 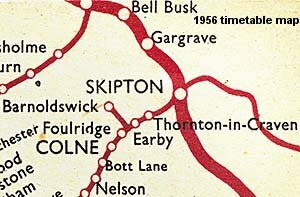 On 20 December 1968 the proposal to close the Skipton-Colne line and the intermediate stations at Earby and Thornton-in-Craven was published, to take effect on 5 May 1969 if no objections were received. The Nelson Leader on 13 December 1968, anticipating the proposal, reported that the Skipton-Colne line recorded an annual loss of £110,000, and a fortnight later added that the estimated earnings were only £6,000. The North East Lancashire Development Committee considered the proposal of closure ‘deplorable’ but recognised that it must be discovered ‘whether the line is useful’. Burnley Town Council feared that the closure would turn North-East Lancashire into a cul-de-sac; in recent years SELRAP the organisation campaigning to reopen the Colne-Skipton line – has recognised the economic reality of this dire prediction. In Craven Herald and Pioneer on 3 January 1969 an interesting feature on the proposed closure highlighted the irony that the Finance Committee of Barnoldswick Council (West Riding of Yorkshire) had recently received two communications from British Rail: one was informing them of BR’s intention to install modern ‘omniticket’ machines at Thornton-in-Craven and Earby stations while the other was its proposal to close the stations on 5 May. One member of the committee quipped that the first ticket issued from these machines could also be the last. In contrast to the apparent strength of feeling against closure in North-East Lancashire, committee member G Hale noted ‘the lack of protest about the proposed closure’. He continued, ‘Apart from the odd person who wished to transport a pram it appears that the public have opted out of using the railways completely’. Endorsing this opinion, Treasurer, Mr J C Roscow recollected that from time to time he had tried to count the passengers using the train between Skipton and Colne, but he ‘couldn’t because there weren’t any; there were never more than one or two people on the two-coach trains’. The public hearing of objections to the Skipton-Colne closure ended on 24 June 1969. Three days later a report was carried in Nelson Leader. Nelson and Colne MP David Waddington (later Lord Waddington) reflected that it was ironic that a proposal to sever the only remaining rai link between North-East Lancashire and Yorkshire (Blackburn to Hellifield having closed in 1962 and Rose Grove to Hebden Bridge/Todmorden in 1965) should be advanced at a time when everybody was paying lip service to the need for better communications between the area’s towns and cities and the rest of the country as a prerequisite of economic growth. The hearing was told that no new road link between North-East Lancashire and the M6 motorway was envisaged in a recent Green Paper in the light of which further isolation of the area by the closure of the Skipton-Colne railway could deter individuals and industries to move to, or remain here; the M65 was eventually opened during the 1980s and ’90s between the M6 and the Colne, but its eastward extension over the ‘Moss’ to join the Aire Valley Expressway has not been built. Specific developments which would benefit from the retention of the railway were brought to the attention of the hearing. One of these was the proposed Central Lancashire New Town (Preston / Leyland / Chorley) and the new Whitewalls Industrial Estate in Colne which needed easy communication with the West Riding. The isolation of North-East Lancs from such places as Leeds, Bradford, York and Hull as well as Skipton itself was emphasised. Mr R Pensam, Chief Assistant Solicitor to Burnley Council, drew attention to the Royal Commission Report on Local Government which recommended the establishment of a new administrative authority to extend from south of Burnley almost as far north as Skipton. Within this new area (which approximates to the modern Borough of Pendle and includes land historically in Lancashire and the West Riding) he pointed out that ‘comprehensive development of the whole area’ was envisaged and ‘the lack of passenger rail services going through the area of the authority would be a very serious handicap … if retained its use would increase’. His words were to be prophetic: fifty years on the contrast between the economic health of Airedale and the less-favoured Pendle is evident. A further area of objection concerned the difficulties for recreational travel that would be caused by the closure of the Skipton-Colne railway. West Riding people wishing to travel to the popular West Lancashire coastal resorts would no longer have easy access by rail. The recreational facilities of the Yorkshire Dales would likewise become difficult of access to the people of East Lancashire’s industrial towns. Objectors pointed out that these impediments to travel were unacceptable at a time when the government was stressing the increased demand for, and economic importance of, leisure facilitiese. The closure of the railway was on condition that road motor services could provide an acceptable replacement. A E Calne, Traffic Manager of Ribble Motor Services (also representing Burnley, Colne and Nelson Joint Transport) confirmed to the hearing that an hourly bus service was provided on weekdays (half hourly on Saturday) between Skipton and Colne and an hourly service was extended to Manchester, so it was possible to travel from Skipton through Thornton-in-Craven, Earby, Colne, Nelson and Brierfield to Manchester without changing; the X43 bus route ran parallel to the railway and stopped at Skipton and Earby stations and in the village of Thornton-in-Craven. Opponents of closure had complained that if the line were to close a ¾-mile walk faced passengers transferring between Colne bus and railway stations as the X43 called at the railway station only on the Manchester to Skipton journey, for passengers to alight, but did not call when travelling in the opposite direction. Mr Calne stated that a stop would be introduced at Colne railway station. He also thought that there would be no need to provide extra buses. In connection with the role of buses as alternative to rail between Skipton and Colne, Mr G H Firth of Earby expected that passengers travelling beyond Colne would be unlikely to change from bus to rail. He also questioned whether buses could cope with passengers at peak times as on several occasions he had been unable to board a full bus and had to wait for the next one. On 19 December 1969 Fred Mulley, the Minister of Transport, gave his consent to the closure which was to take place for both passenger and goods traffic on 2 February 1970. Perhaps the inevitability of this decision explains the silence of Nelson Leader at the news. On 9 January the newspaper carried the formal announcement of closure. The Nelson Leader (6 February 1970) carried an article on the closure of the Skipton-Colne line: ‘Crowded out on the Last Train’. On Saturday 1 February there was standing room only with over a hundred people crammed into the two-car train from Colne ‘to the surprise of the small number of regular passengers who had expected their last trip to pass without incident’. More people joined the train at Earby where alighting passengers remained on the platform to wave farewell. The final timetabled passenger train on the line was the 20.58 from Skipton to Manchester. This, too, was filled to capacity and it drew out of the station ‘to the accompaniment of cheers and the whir of ciné-cameras as photographers’ flash bulbs illuminated the scene’. Aboard the train members of the Keighley & Worth Valley Railway Society used the opportunity to distribute publicity material for the revived Oxenhope Branch. At Earby there were more flash bulbs and farewell cheers, and at Colne the compassionate railway officials permitted the passengers from the final train to retain their tickets as souvenirs. The following day a chartered DMU excursion ran between Skipton and Colne (return). With indecent haste, as soon as this train arrived back at Skipton the junction points were severed. Dates of track-lifting between Skipton North Junction and Colne have not been found, but Binns states that after closure the tracks were ‘soon lifted’. Binns states that after closure the tracks were ‘soon lifted’. The earliest reliably-dated photographic evidence indicates that the tracks had been lifted by January 1974. On 28 August 1942 a morning coal empties train is passing Thornton-in-Craven from Rose Grove to Stourton (south of Leeds) and it was to return that afternoon with a full load. These are the days before nationalisation of the British coal industry and the numerous private coal wagons are a source of interest. The loco No.9571 is a Fowler-designed Class 7F 0-8-0 built at the LMS Crewe works in October 1929. Renumbered 49571 by British Railways she was withdrawn from 27B, Aintree shed, in June 1951 and cut up at Horwich works later that month. The British Rail London Midland Region timetable issued in May 1970 indicated that the Skipton-Colne service had been withdrawn, but the accompanying map which purported to show the railway network on 5 January 1970 misleadingly showed the line to have closed a month before its actual demise. The ‘closure culture’ in British Rail would not be expunged for several years, and there were suspicions that the abandonment of 11½ miles of this useful trans-Pennine route would be followed by the closure of the surviving stump from Colne to Burnley, and possibly beyond. These fears were given substance when in 1971 the extensive station facilities at Colne, now a terminus, were almost entirely demolished leaving only a single platform with a ‘bus’ shelter and an hourly train service. The final stretch of the truncated line, from Chaffers Siding (north-east of Nelson) to the Colne terminus was singled in 1971, followed in December 1986 by the route through Nelson, Brierfield and Burnley Central as far as Gannow Junction (Rose Grove). Since then the line has had a basic hourly weekday service (two-hourly on Sunday) operated by some of the oldest and poorest quality DMU stock on the national railway network. This is in stark contrast to the excellent electric train service between Leeds and Skipton which is among the busiest commuter railways in Britain. Founded in 2001, SELRAP (Skipton East Lancashire Rail Action Partnership) is campaigning to reopen the Skipton to Colne railway line, as part of the rail network of the United Kingdom; its motto is ‘Connecting communities across the North’. The campaign has attracted support from local MPs, councils, businesses and numerous members of the public with its strong economic case to restore the 11½-mile link. The reopened line would probably have one intermediate ‘West Craven Parkway’ station to serve Earby, Barnoldswick and the surrounding area. The Colne Branch followed the lowest altitude route (the ‘Foulridge Gap’) through the mid and south Pennines. This low watershed between the Aire and Ribble basins is about 500ft above sea level and it was already used by a turnpike and the Leeds & Liverpool Canal, opened through the gap in 1796 and for the full distance between Leeds and Liverpool in 1816. 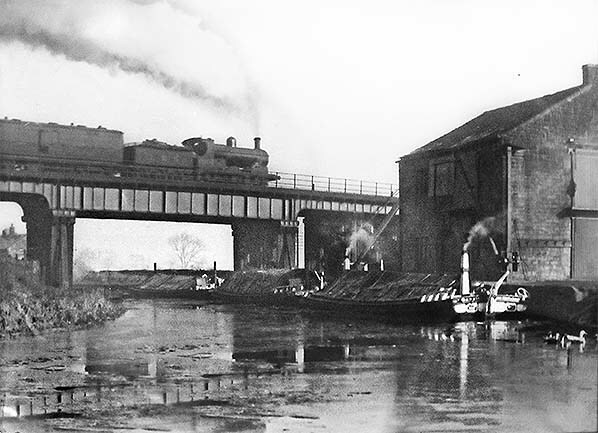 The canal required a 1,640yd tunnel to cross the summit, but the railway was the only one that crossed the Pennines between Lancashire and Yorkshire without a tunnel through the hills. Gradients between Skipton North Junction and Colne nowhere exceeded 1 in 141, and the summit near Foulridge was approached at 1 in 396 from Colne and 1 in 231 from Thornton-in-Craven. Reflecting its origins from the Leeds end, travel on the ‘branch’ was described as ‘Up’ towards Skipton and ‘Down’ towards Colne. Beyond Colne on the former East Lancashire / Lancashire & Yorkshire line the descriptions were reversed, ‘Up’ being towards Preston/Manchester and ‘Down’ towards Colne. At its northern end the Colne Branch left the line to Lancaster, Ingleton and Carlisle at Skipton North Junction, soon crossing the River Aire on an iron bridge with masonry supports (now demolished) and following a route on a rising gradient of 1 in 141 at the edge of the Craven lowlands to Elslack station. A short distance before the next station, Thornton-in-Craven, a branch led northwards to serve Thornton Quarry and lime works, carried by a bridge over the old Skipton –Colne road and passing through a tunnel under the present A56. Approaching the town of Earby the route of the line leaves what has since 1974 been the county of North Yorkshire and enters Lancashire, but the line closed four years before this revision of administrative boundaries took place. The Skipton-Colne line crossed the A56 on the level, beyond which were the goods and then the passenger facilities of Earby station. Immediately beyond the station was a level crossing, and about half a mile onwards the Barnoldswick Branch swung off sharply north-westwards. During World War 1 a Ministry of Munitions (MoM) explosives depot was opened on the flat land on the up side of the railway, a short distance south-west of Barnoldswick Junction, and this was served by loop sidings on the up side of Skipton-Colne line and a branch into the MoM site which split into several sidings to serve a number of explosives stores. The depot closed and the associated railways were removed by the late 1920s. For further details see the Salterforth Bottoms Cordite Store feature. Looking north-east towards Foulridge Viaduct over the Leeds & Liverpool Canal. The locomotive in LMS livery appears to be an ex-LYR Aspinall-designed Class 28 0-6-0. Until the administrative boundary changes in 1974 the line thus far was in the West Riding of Yorkshire, and Lancashire was entered a short distance north of the village of Foulridge. 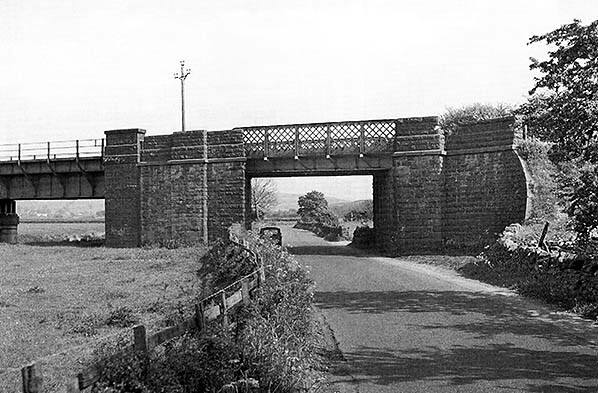 The line was carried over the adjacent Leeds & Liverpool on a low iron viaduct resting on masonry piers (now demolished) before entering Foulridge station. Here the line reached its summit, the watershed between Earby Beck (draining into the Aire and ultimately the North Sea) and Pendle Water (draining into the Calder and ultimately the Irish Sea). At this point the canal dives into a 1,640yd tunnel but the railway, constructed 30 years after the canal had fully opened, was engineered to breast the summit without the need for a tunnel and with relatively gentle gradients; all other railway routes across the south Pennines required tunnels to cross from east to west, some of them (such as Summit, Standedge, Totley, Cowburn and Woodhead) being of considerable length. The railway re-crossed the canal in its tunnel before reaching the town of Colne. A network of sidings announced the approach to Colne where the station was shared with the East Lancashire (later Lancashire & Yorkshire) company. 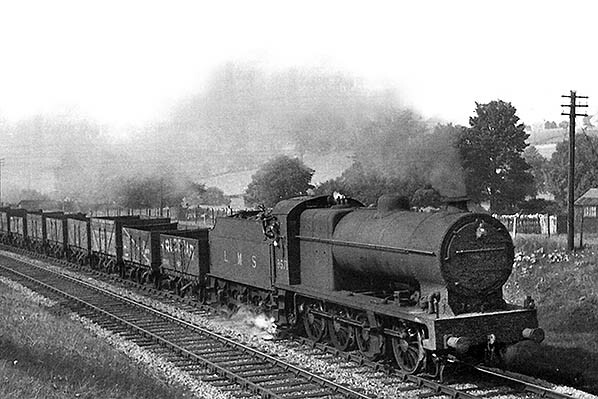 This picture is a rarity, taken during World War 2 when photography of British railway operations was prohibited and showing what Binns (2008) understood to be the only known appearance of this class of express locomotive on the Colne Branch. On 15 April 1942 at 11.06am ‘Patriot’ Class 5XP 4-6-0 No.5528 is passing Thornton-in-Craven with a westbound (down) empty stock train of 1st and 3rd class brake composites, probably a diversion onto the West Coast main line routed via Colne because of the war. 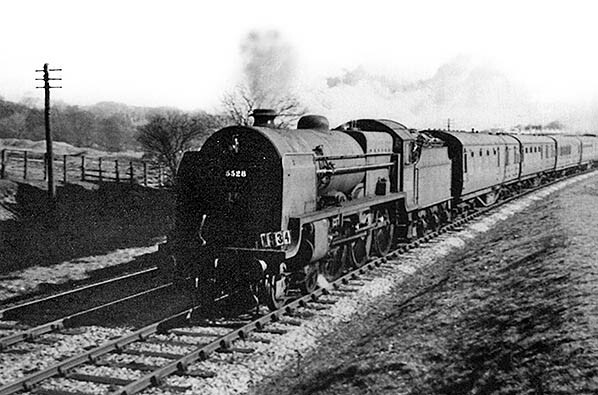 The Fowler-designed locomotive emerged from the LMS Derby works in April 1933. Carrying the name ‘R E M E’ and renumbered 45528 by British Railways she was in service until January 1963 when she was withdrawn from 1A, Willesden shed, before being cut up at Crewe works two months later. Last day ticket from Peter Noon. Timetables, timetable map, Network for Development map and Airey's map from Alan Young.